To celebrate the DVD and Blu-ray launch of the first series of HBO Home Entertainment’s critically acclaimed, epic crime drama Boardwalk Empire on 9 January, we’ve set up a brand new competition to warm the winter cockles. Simply answer the following question to have a chance of winning the box set: Which member of the cast of Boardwalk Empire has recently been appointed as the face of Prada? Email your answers along with your name and address to [email protected] before 5pm on Friday the 6th January 2012. Charting the birth of organised crime, the series chronicles the life and times of Enoch ‘Nucky’ Thompson (Steve Buscemi – The Big Lebowski, Armageddon), the Atlantic City treasurer whose double role as politician and bootlegger makes him the most powerful man on the Boardwalk. Buscemi is accompanied by an outstanding all-star cast depicting real life people from gangster legend, including British stars Kelly MacDonald (Gosford Park, No Country for Old Men) and Stephen Graham (Tinker, Tailor, Soldier, Spy, This is England,) as Al Capone, plus Michael Pitt (Hugo, The Dreamers) as Jimmy Boyd, Michael Shannon (Man of Steel, Machine Gun Preacher) as Agent Nelson Van Alden and Shea Whigham (Take Shelter, The Lincoln Lawyer) as Nucky’s younger brother, Eli Thompson. 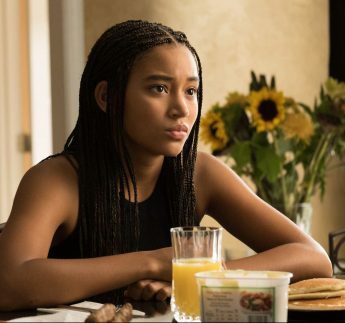 Win a copy of powerful teen drama The Hate U Give, starring Wonderbabe Amandla Stenberg.